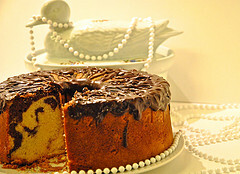 A swirl of chocolate marries delightfully with vanilla, offering the best of both worlds in this timeless marbled pound cake. After a couple of attempts in my baking history to make a pound cake with a nice marbled effect, I finally achieved success! 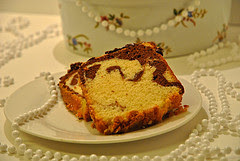 I simply created my own marbled pound cake from my Very Happy Birthday Pound Cake recipe, combined a couple of techniques for marbling, and I couldn't be more pleased! We recently celebrated a hallmark birthday of my daughter's mother-in-law with this marvelous pound cake, and she says it's now her favorite cake! This is definitely one to keep around to enjoy with your coffee! 7. Remove 2 c. of the batter and blend the cocoa into it. 8. Spoon and spread evenly 1/2 of the light batter into the prepared pan. 9. 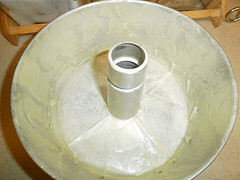 Cover the light batter evenly around the middle, within about 1" of the edges, with 1/3 of the chocolate batter. 10. Spoon and carefully spread evenly the remaining light batter over the chocolate batter, taking care not to disturb the chocolate batter. 11. Spoon and carefully spread evenly the remaining chocolate batter around the middle of the light batter, within about 1" of the edges. 12. 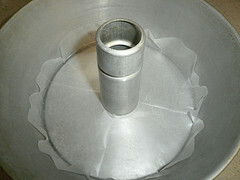 Using a metal frosting spatula (or flat, thin-bladed knife) swirl gently through the layers of the batter to marble, leaving definite areas of light and dark. Don't take the spatula all the way to the bottom of the pan or swirl too vigorously, since you'll lose the marble effect. 13. Bake for l hr. and approx. 35 minutes (check after 1 hr. and 25 minutes), or until a toothpick comes out clean and the cake springs back when gently pressed with your finger. 14. Cover the cake with a clean dish towel and cool on a rack away from drafts overnight. 15. Invert the cake onto a serving platter, release from the pan and carefully remove the wax paper, if used. Drizzle with the chocolate glaze. In a small saucepan, heat the chocolate chips, butter and corn syrup over low heat, whisking constantly, until the chocolate is almost melted. I know you want some now...brew some good coffee, serve with a premium vanilla ice cream and enjoy the compliments! Fantastic presentation! 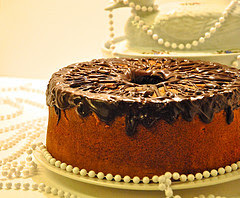 I would love some cake right now! We're coming to your house for coffee and this cake, see ya soon! Could you pick up some vanilla ice cream on the way...thanks! This certainly is a classic and beautiful cake, Bonnie! Thank you for sharing it with me!